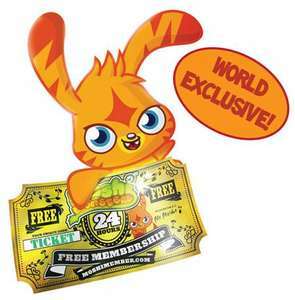 Exclusive: Free 24 Hour Membership For All! It has been uncovered by yours truly that there's a super secret code that will give you a 24 hour FREE MEMBERSHIP. This is history in the making! Monsters all over town are talking about it. When asked about this monumental news, Mizz Snoots from Horrods said, "It truly is the most amazing thing to happen in Monstro City since my doors first opened, many Moshi moons ago." Head over to moshimember.com and enter the code TICKET. Note: This code will only work if you're not already a member! Why the cold temperature? Works for me, make sure you actually have interest in Moshi Monsters before voting. Also make sure you enter the code on the moshimember.com and not the normal logon page. Welcome to the unrestricted internet, if your kids are able to use Google this is the least of your worries. I can't comment on how the back-end teams control or support issues but yes there is a message board anyone can post anything on. I guess its all part of the social network, many other gaming sites are similar or worse, for us we initially had worries but after my daughter understood never to give out personal details and ignore bad messages or rude comments etc, she actually became more vigilant and was quite a good lesson to learn with anything on the internet. whats the code to be a 24 hour member? Already a member but I don't no if it will work or not. The code TICKET (when following the instructions) works and works well - heat added. The internet is a virus ridden, pornographic heaven with millions of people pretending they are someone else. You need to monitor your children on everything they do - Moshi Monsters is no execption - it is no worse or better than anywhere else. Including some of teh bad language I see on sites like hotukdeals.com!! I still come here and I will continue to monitor my kids internet access wherever they go. PLEASE tell me the 24 hour member code. PLEASE PLEASE PLEASE PLEASE!! !